We received a letter and packing slip in the mail, informing us that I have won my freedom from the Iceman. The cords will be forever cut and the demanding cooler will be shipped back to it’s place of origin on Monday. From that day forward, Brni’s shoulder will wear bags of frozen peas and I will allow whatever ice is left to melt in the sun. An offering tinged with a smirk and a freeing shrug. So, it’s been ten days since Brni’s shoulder surgery and he’s doing phenomenally well. He had his second PT session yesterday and his therapist was practically giddy with his progress. At the same time, Brni’s mood has lifted a great deal, almost as if a switch has been flipped. He’s looking and acting more like himself. Definitely coming out of the anesthesia/drug induced doldrums. I find it almost magical how a body can go through so much and heal so quickly. It’s an amazing process, but one I hope very few of us need go through. But, if you do, I hope you are surrounded by love and kindness, for that is the true healing salve. And, as Brni heals, my head turns to look at the lump of clay waiting for me on my work table. This one might be a bird, maybe a heron stretching her neck to the heavens. I’m so tired. It’s surprising what a toll it takes on a person to care for another who is infirm or disabled or just indisposed. What is strange is that everything I’m doing, I do normally throughout the course of the day. I make coffee, get breakfast, lunch, dinner. I straighten, clean, make the bed, feed the animals, etc. The only additional tasks are emptying and filling the “iceman,” hooking Brni up to the machine, extra errands for things like bandages, thermometers, ice, ginger ale, etc. And watching over (hovering?) Brni to make sure he’s O-K-A-Y. In the everyday, no-surgery world, Brni does an amazing amount of work around here. I honestly had not realized how much until the past few days doing both my stuff as well as his stuff. And I’ve begun to realize that his stuff is way more than I thought. I’m coming away from this with a new respect for the usual, every day chores that Brni does just as a matter of course. I guess it takes something like this to open our eyes to the little things that take up time and really do matter. So, yeah, I’m tired and stressed with the added responsibility, but I’m also happy to do it. It’s a good kind of tired and the stress is worth it if it means Brni can get through his day without constant pain. Tomorrow is his first physical therapy session–the next step on the path of healing. pictures of life post brni’s shoulder surgery. here’s the “iceman” which is essentially a small beer cooler with a fish tank pump in it. this is the thing that has enslaved me. 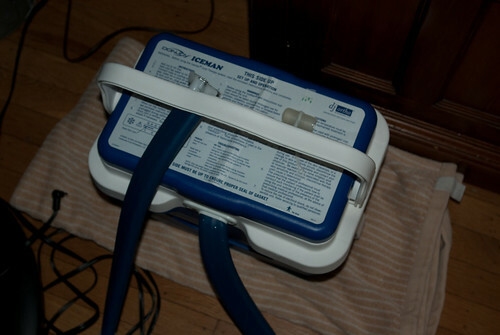 i fill it to the brim with ice, fill again with water enough to cover the bottom of the pump, hook up the massive blue hoses to brni’s shoulder pad and then plug it in. it whines frigid water up into the shoulder pad, keeping brni’s shoulder from swelling and reeking havoc. he needs to be hooked up to this 24/7 for 2 weeks. i love fishing ice out of the cooler out on the deck at 4:30 in the morning. it’s what i live for. this is what happens to a brni when linked to the iceman. today we removed the dressing for the first time. it looks like the surgeon was unable to save the top of brni’s sun tattoo, but to compensate, added some lovely purple marks of his own. wow. this is a tiny tiny incision! amazing what they can do laproscopically, isn’t it? but, no matter how bad things get, you can’t keep a good brni down…well, maybe down, but never offline. so, the follow up with the surgeon was better than expected. Actually, I’d expected the x-ray would show that the graft didn’t take and the screws and rods had all broken. Instead, despite my usual worst-luck-this-side-of-the-Mississippi, everything is good. The bone graft is grafting, the screws are screwed in and holding and I’m allowed out of the brace. I can walk as far as I want and I can do hills, so no more pacing the 200 feet of flat walk on our hilly street–it’s around the block from now on. I can even drive (only for short jaunts, but after 6 weeks of confinement, I’ll take it and be happy about it too). Starting Monday, it’s off to physical therapy 3x a week for the next 7 weeks. I can’t wait to get my muscles back. It’s amazing what slashing the back muscles does to your hamstrings and abdominals. Don’t ask me how, but the hams are tight and the abs are, shall we say, not so tight. I don’t care. I’m fine. The bones and hardware are fine and the brace is off. It’s good. It’s all good. something to look forward to: I’ve ordered copies of the x-rays with the screws and rods…I will be scanning and posting them, and then making art out of them. so, i’ve decided that i’ve typed enough about my surgery. everything else that happened was covered more than adequately by brni. a few words about recovery might be forthcoming, but hopefully, as my world gets a bit larger, it’ll get more interesting. right now i’m so limited and essentially confined to pacing the downstairs, reclining in my chair or lying in my bed. heh–not a whole lot of fodder there. plus, my energy levels are at an all time low. i tried to catch up on all things bloggish, but wow….you all let life go on as usual and i haven’t had the energy to go back in time as far as march 5.
well, thanks to all for caring. this has been a painful but amazing journey so far, and i’ve gained a new level of appreciation for my friends and family. well, it’s time to get up and pace the floor. “You are about to enter a world of pain.” Walter from The Big Lebowski. A slow rumble of pain brings me up from nowhere. From nowhere to a world of pain. Only pain. My back (I have a back?) is held in a vice. It is a dark, oily metal thing. Not the beautiful vice I used to play with in my grandfather’s garage. A beautiful curved thing with a rich patina attached to a desk. The crank was a metal cylindrical rod with two large round balls on each end. The balls kept the crank from from sliding all the way through the hole. Despite my grandfather’s warnings, I used to place the index finger of my left hand in the vice and slowly tighten it just until I couldn’t take my finger out but before I crushed it. The vice that held my back has been cranked beyond the crushing point. My eyes open to a harsh, mustard white glare and deafening noise fills my head. I recognize nothing in this place. There are curved planes thrusting up out of the glare. The planes originate behind me, wrapping around and above, moving in and out of the glare on metal gears. Black noise slashes zaggedly from the right and something brown and square presses in from the left. Above me, my memory is spread out like cards from a rolodex between a magicians hands. One finger flips them in a blur in one direction, the other finger flips them back. Back and forth, hunting for the memory “surgery” but not finding it. Flip flip flip flip flip no surgery flip flip no memory flip flip who am i? flip flip flip is this hell? Eyes above a mask drift up from behind the brown square on my left. “Yes, more.” I have a voice. The planes are moving, resolving and softening into what looks like walls and doors and a ceiling. The noise is still cutting through in jagged black streaks. I see eyes coming closer, looking at me. I recognize these eyes and the hair. I see Krys and her eyes see me and they blink wide open with love and worry. Oh god, I know who I am. Brni behind and to the left of Krys. I can’t reach him. He’s moving behind me. I can’t see him. They are gone. I am gone. A woman in a mask is telling me I have a red button for help and blue ones for lights and TV. Krys is standing over me. Brni is here. They took Brni and I back in a matter of minutes after we checked in with the registration desk. The room was crowded to bursting at 5:30 am, so I thought we’d have a long wait. No such luck. I don’t remember what happened next, except that at some point in time I found myself on a gurney being wheeled away from Brni as my eyes filled with tears. How do you describe the feelings of utter helplessness and impending doom (which you agreed to when you signed all those consent forms)? You don’t. You just sit quietly with big eyes and hope that all the worst things don’t happen. I don’t know if all hospitals are like this, but orthopeadic surgery occurs in an off-white alien world. They wheeled me into a very large round room, reminiscent of an arena. The overriding feel of the room was one of muted chrome in a filmy white space. Every color was washed out. Even the people seemed desaturated. Patients were inserted into slots that ringed the edges of the room. Our feet all pointed to the place in the circle where teams of doctors, nurses and techs would group and disperse. Teams gathered their equipment at this place and then went to their assigned slots to prep their assigned patients. “I can’t believe we got you! When we came in to look for our patient and saw you, we were so excited. We’ve got the healthy one! Can you tell me your name and birthdate?” This was the leader of the “nerve team” responsible for monitoring my nervous system throughout the lumbar fusion, lamanectomy and decompression. She began by gathering my hair in her hands and placing it out of the way. “You have beautiful hair.” What a nice thing to say to someone literally scared to death. I could almost pretend I was going to have my hair washed. Then she started sanding down a spot at the top of my hairline. “This is to reduce resistance,” is what I think she said. She sanded just to the point of pain and then applied what felt like a round, gold disk. I don’t know if it was gold or round, but it felt like it was. She then placed more at the base of my skull and other points on my head. At some point the surgeon showed up and everyone backed away from me in deference to him. He was smiling, genuinely happy and very very awake. He had me sit up while he wrote stuff on my lower back with a sharp pen. I tried to tell him there’s some confusion with what is being fused, but he said not to worry, I’ll do just fine. He disappeared as fast as he’d appeared and the others closed in with renewed fervor. By the time they wheeled me into the operating room, I was woozy with the beginnings of shock and I hadn’t had any of the nice pre-op meds that my friends had swooned about. The operating room was small and cramped, dominated by this huge light fixture on a mechanical arm like thing. The paint had been worn off in great bare metal patches. I said, “I thought operating rooms were supposed to be new and shiny.” “That’s only on TV.” The anesthesiologist walked up behind me, leaned over and said something and the next thing I was aware of was the pain.